The Darien and Willowbrook libraries were located in small storefronts within one mile of each other. They served similar populations and struggled with funding. As demand for services and inadequate space became problems, the libraries decided to merge to better serve the public. Trustees from both libraries formed a committee, and in 1986 the libraries received a $34,500 Project L.I.M.E. grant to explore the pros and cons of a merger. On November 3, 1987, 85% of voters from the Darien and Willowbrook Library Districts approved the merger. 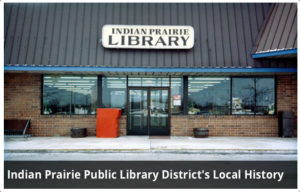 This merger led to the establishment of the Indian Prairie Public Library District on July 1, 1988. Residents from both districts submitted suggestions for the new library’s name. Board members from the Willowbrook and Darien libraries chose “Indian Prairie Public Library” as the name. In 1988, the combined library boards purchased 3.9 acres on the southwest corner of Clarendon Hills and Plainfield Roads for $400,000 as the future site of a new library building. The new library district moved into a rented 8,580 square foot storefront at 337 West 75th Street in the Willow Commons Shopping Center. The site was intended to be temporary as it was too small to serve the combined population of 35,740 residents. During its first year, the library had over 1,000 daily visitors. Voters flatly rejected a referendum in 1989 which would have funded a 64,000 square foot library and increased operating costs. With input from a Citizens Advisory Committee the library revamped its plans and sought funding for a 35,000 square foot building. Despite the scaled down plans, the referendum failed in 1991. The library board and Citizens Committee continued to work for a new library building to better serve the community. In 1993 voters approved a $4.95 million bond issue for a 34,500 square foot building on land that the district had purchased in 1997 and a one-time allocation of $200,000 to purchase new materials. 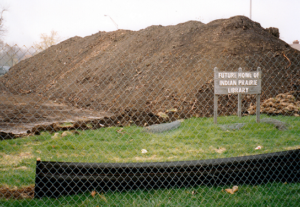 On September 11, 1994, the library held a groundbreaking ceremony at the site of the new building at the southwestern corner of Clarendon Hills and Plainfield Roads. Construction began in November, but a problem with the fabrication of the steel slowed the progress. On February 16, 1996 the building officially opened to the public. The library’s opening collection included almost 77,000 books, 3,000 videos, and 3, 750 audio cassettes and compact discs. The building encompassed 43,394 square feet which included the basement and 4,000 square feet of unfinished space on the second floor. A dedication ceremony for the new two story building was held on Sunday, April 14, 1996 as part of National Libraries Week. When the library opened, the second floor had 4,000 square feet of unused space on the second floor. In 2003, the library doubled the size of the meeting room and the Youth Services Department expanded into half of the unused space. Library Director Lee Schacht retired in 2006 and Jamie Bukovac became director of the library. During October 2010, the library closed to complete a $1.3 million renovation to the interior of the building. The renovation expanded the teen area and created a new family center. The project revamped the lobby, relocated the restrooms on the first floor, and added the Inspiration Café. The magazines and computers were relocated to the first floor.